Hey everyone! 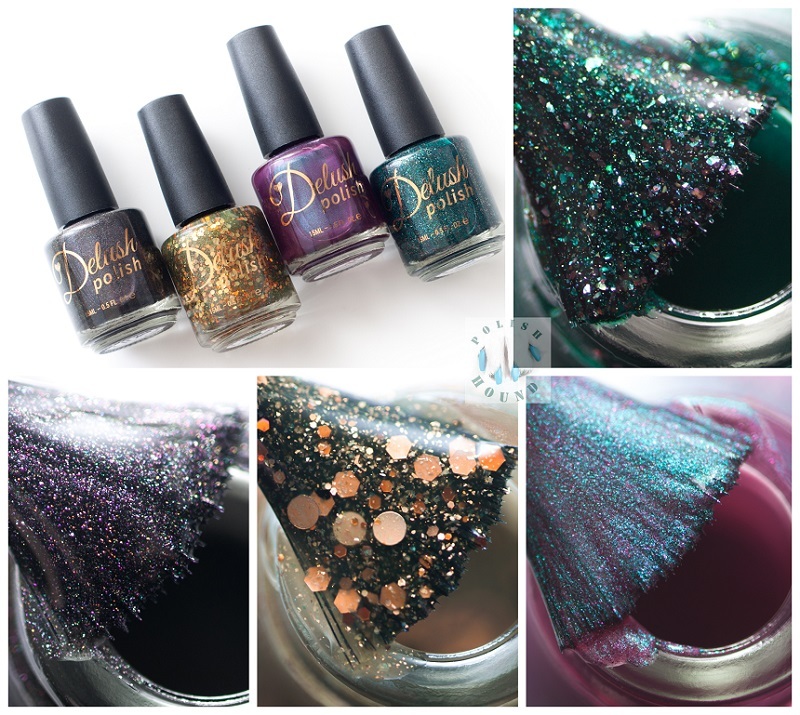 Today I have half of the new Delush Polish Fall 2016 collection, called Knights of Thrones, to share with you! This is a follow-up to last Fall's Dames of Thrones (GoT- inspired!) collection, and this time it's inspired by pivotal male characters in the show/series! 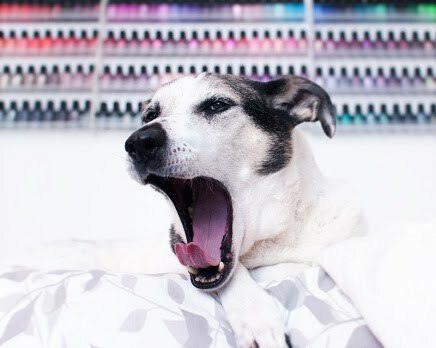 This collection launches today at Noon, EST at delushpolish.com! Here are the shades I'll be sharing with you! How yummy do these look?! Let's get started! Warden of Darkness is a blackened linear holographic with color-shifting blue-to-purple/ magenta shimmer. This one is inspired by Ramsay Bolton, of course! He was a pretty evil and sadistic dude! Formula: It's thicker than many holo formulas I've tried, but the texture is nice, and I feel the thicker nature does contribute to more opacity. The first coat is nearly opaque with no patchiness and just some sheerness at the nail tips. The second coat darkens the base color to match the liquid bottle color, and becomes opaque. Nice! This polish is inspired by Petyr Baelish, AKA Littlefinger, who is actually one of my favorite characters! Who can resist his slippery ways and ever-changing accent?! Lord of Envy is a saturated, blue-leaning emerald green linear holographic with small bronze flake shimmer. Sometimes I think those bronze shimmers are shifting to red too, but I'm not sure! This kind of teal looks very blue in certain lighting and very, very green in others. It's very changeable, depending! Formula: It's on the thicker side, and a bit viscous-feeling on the brush. However, that doesn't translate to the nail, and it's actually a breeze to apply! It's pigmented too, and you can have this basically opaque on the first coat if you have a heavier hand. Could need thinner in the future, but is perfect now! Opaque in two coats! Kingslayer is a swampy green jelly base filled with a couple sizes of bronze hex glitters, medium chartreuse circle glitters, bronze and green microglitters, as well as bronze shimmer. Super unique shade, and definitely a Fall color! Infamously, "Kingslayer" is Jamie Lannister's nickname! Formula: It's got a superb texture and consistency for a glitter polish! It glides onto the nail smoothly, and you don't have to dab glitters. The base is on the sheerer side as a jelly, but builds nicely, and two coats is about ~90% opaque. I think many people will be satisfied there, but I wanted total full coverage, so added a third! Easy, workable formula though, and the jelly base really does add depth to the shade! This one is inspired by everyone's favorite character, Tyrion Lannister, who is a bit of a functional lush! Master of Wine is a red-based plum (warm, warm purple) with color-shifting blue-green shimmer. It's difficult to capture in photos but there are also very subtle red or magenta shimmery bits that twinkle when the light is very direct. Subtle, so pretty! The shimmer is very dense and super duper intense in this one, and it pretty much gives the polish a duochrome-like effect! Gorgeous! Formula: It has a texture that I would say is on the thicker side for most people, but it's creamy and easy to apply! Brushstrokes become very minimal to invisible as the polish dries down. If care is taken to wrap the nail tips during each coat, then this is easily opaque in two coats. Nice! Overall, If this half of the collection is any indication of the set in its entirety, well, I think it's kind of fabulous! I expected to love Master of Wine and Lord of Envy the most (also a couple of my fave GoT characters! ), but I couldn't deny the awesomeness of Kingslayer once I got it on my nails! It's not the most flattering shade on me, but it's not terribly unflattering either- and it's just got amazing depth, and the glitters and shimmers in it are curated so nicely! Warden of Darkness took me by surprise too with it's magenta color-shifting shimmer! Formula-wise, everything here is pretty great! These are nice rich formulas with good pigmentation, and great brush-feel. Easy to work with! So, no, I have nothing bad to say about these four polishes at all! Which of these do you love the most? Tell me your favorite Game of Thrones character down below!